The 28.95 metre motor yacht Cristobal, listed for sale by Chris Collins at Ocean Independence, has had a $300,000 price reduction. Cristobal was built in GRP by UK yard Princess Yachts to RINA class and delivered in 2009 with a major refit in 2014. Generous accommodation is for eight guests in four cabins. These consist of a master suite amidships with a king sized bed, a VIP suite forward with a king sized bed, a double with a queen sized bed and a twin cabin convertible into a double. All cabins come with television screens, entertainment systems and full en-suite facilities. A further three cabins sleep five crew. The main saloon of this yacht for sale offers a comfortable lounge area with ample seating and a central coffee table, ideal for relaxation. Forward is the formal dining area with seating for up to eight guests. The aft deck adjacent to the saloon features an al fresco dining area, complete with seating, a wet bar and partial shade. Her walk around main deck leads to the foredeck’s double sun pad and additional seating area, an ideal private retreat when in port. The 2014 refit saw a complete reconfiguration of the sun deck. The aft area is devoted to relaxation and a gym while to starboard forward is a large bar with a sink, fridge, ice maker and a Teppanyaki grill. In front of the bar a large LCD television monitor serves as an open air cinema. To port a big integrated sofa seats eight guests for al fresco dining and the entire deck can be protected from the sun by a hard top with a large sliding roof. Twin 2,400hp MTU engines give a cruising speed of 16 knots and she is fitted with zero-speed stabilisers to eliminate any rolling motion. 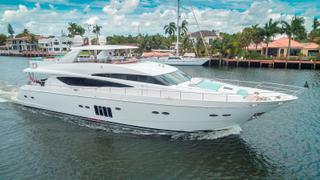 On display at the Palm Beach yacht show, Cristobal is now asking $3,600,000.